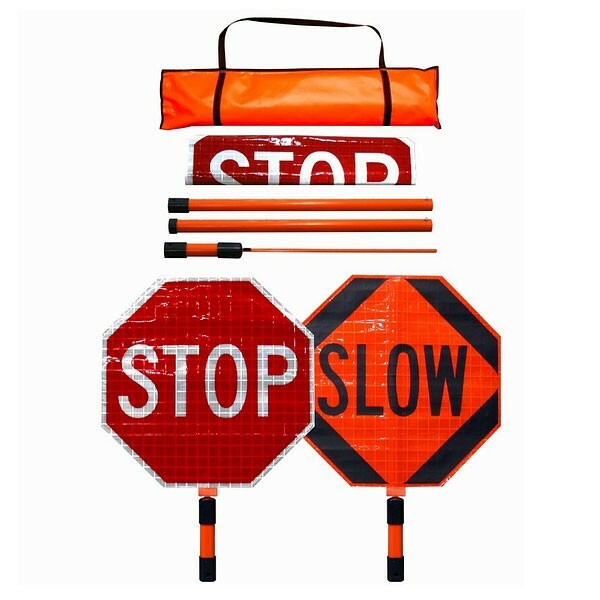 Our 18” Roll-Up Stop/Slow Paddle is made out of Superbright reflective vinyl and complies with MUTCD standards. This roll-up stores in a compact case to minimize storage space and prevents damage to sign face when not in use. This particular reflective stop/slow paddle comes with a 3 piece plastic staff and heavy-duty storage bag. The handle features flat facets front and back which aids user in determining the sign’s orientation, minimizing the amount of time their attention is away from traffic. A thick rounded bottom cap protects the handle from wear and makes the sign easy to rotate.